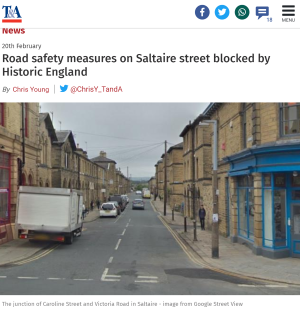 But Saltaire’s status as a UNESCO World Heritage Site has halted the scheme – with Historic England claiming the measures would ‘adversely affect the character’ of the village. Officers will meet with local Councillors next week to see how to progress, and may have to use measures like staggered parking to reduce speeds on the road. The plans have been estimated to cost £10,000. ‘We had the scheme, but that had to be assessed in terms of Saltaire’s heritage and the impact it would have on the street scene. Whatever scheme is chosen needs the support of residents whose houses front right onto the road. It is a beautiful area, but it is also a living community through which flows thousands of commuters a week, and we have a responsibility to residents to make sure this causes as few issues as possible,’ he said.